We appreciate your feedback about your support experience with SkyVerge, developers of URL Coupons. This helps us maintain high standards on the WooMarketplace, and helps SkyVerge improve. URL coupons gives you the perfect way to make your print advertising actionable, or you can also help customers remember coupons so that they actually complete purchases. Measure the success of your pay-per-click ad campaigns by using a coupon URL, or use the plugin to only allow URL coupons. 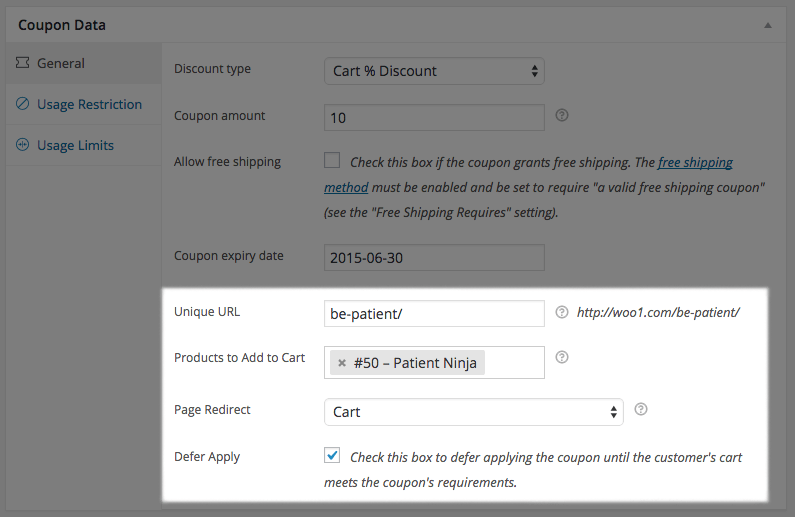 You can redirect customers if you choose once they’ve visited a coupon URL. This allows you to optionally add products to the cart when the URL is visited and immediately send customers somewhere, such as the cart or checkout. This reduces as many barriers to purchasing as possible, and can even be used with WooCommerce One Page Checkout for a completely seamless, one-page coupon application and purchasing experience. You can use a generic coupon URL, such as mystore.com/coupon/thanks, that will apply a “thank you” coupon. However, since this coupon URL doesn’t use a trailing slash, you can also use this to personalize the experience for your customers, as the URLs mystore.com/coupon/thanks-john or mystore.com/coupon/thanksjane will also work for this coupon. You can also disable this behavior by using a trailing slash like mystore.com/coupon/thanks/ if you’d prefer to use one definite URL for coupons instead. Stop customers from abandoning your checkout to go coupon hunting. Improve conversions of your advertising campaigns by automating discounts to encourage purchasing. Help current customers access and share the discounts you offer. Automatically apply coupons for page or post visitors to provide “easter eggs” and rewards. URL Coupons can help you integrate your coupons throughout your site and provide advanced ways to use them. Add a unique URL to the coupon and start using the new link in your marketing. That’s it! Sit back and enjoy more efficient advertising and coupon handling!